I hope everyone has had a wonderful start to 2016. I spent New Year's eve the way I like, in the studio. 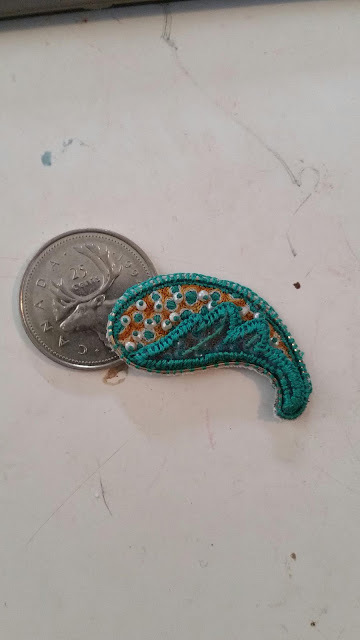 I worked up a new brooch/pendant piece. It's modeled after the Australian Aboriginal dot paintings. I used this combo of colors for the notebooks I did earlier. I like the juxtaposition of the earthy, organic feel of the dots against the formality of the Victorian leaf shape. There's still a little fine tuning to do. I want to re-whip stitch the veins on the leaf with a lighter shade of teal, add the pin backing and embroider the back. I'm debating a delicate lace edge next to the leaf to emphasize the two parts of the piece. On to more stitching! Ciao!